How delicious is that! 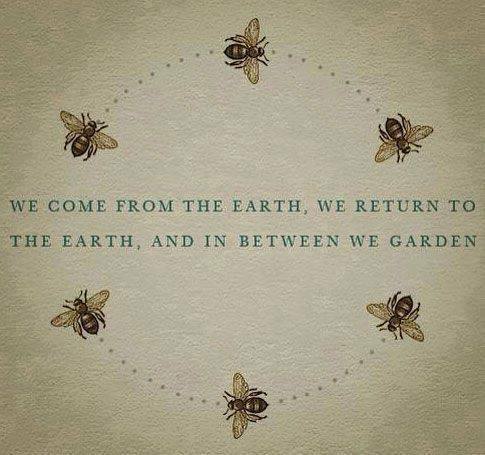 It made me think of the ever-so-many charming gardeners who have tended my soul. This line of thinking has been percolating around since then. So, today, when the photo above came through my Facebook newsfeed, it was such a lovely connection for me. This seems, at least to me, to be the very essence of life. On the church calendar, it is Ordinary Time. If I understand correctly it’s basically everything that isn’t Advent/Christmas or Resurrection (Easter) related. Which is most of the year. The longest season of the church’s liturgy is comprised of Ordinary Time. The first action to be taken is to pull ourselves together. If we are going to be destroyed by an atomic bomb, let that bomb, when it comes, find us doing sensible and human things — praying, working, teaching, reading, listening to music, bathing the children, playing tennis, chatting to our friends over a pint and a game of darts — not huddled together like frightened sheep and thinking about bombs. That is the in-between time, the ordinary time. The things he suggests all tend to the gardens of our souls. For most folks, Christmas is over. For those in the liturgical tradition we have 11 more days in our Christmas season and soon, comes Ordinary Time. What can we do with our gardens? Which tools will we choose to use? Which patches and people will be allowed to lie fallow, drawing strength from the silences and allowed to rest from the tilling? Which patches will be ploughed up? To whom and in what ways will we add rich compost? Which of us needs gentle watering and which needs the soaking deluge? And where does some weeding and pruning need to occur? I hope, gentle reader, that you are looking around at the souls near you that help your soul blossom and feeling blessed. Sometimes the work takes a long, long time to see fruition. Sometimes the fruit is a very short season indeed. I hope this upcoming season of Ordinary, In-Between Times is one that finds you gardening with those you love.